A pair of frontrunners for the Centennial League crown will square off on Friday when Topeka High travels to Junction City. Topeka High entered 2016 with nine total returning starters from a team that finished 8-2 a season ago with a first-round loss to eventual state champion Derby. The Trojans return a super athlete at quarterback in Corey Thomas. Thomas put up more than 1,900 yards of total offense a season ago, and opened the 2016 season with 178 yards rushing and three touchdowns in the Trojan’s 30-13 win over Topeka Hayden. Topeka actually trailed Hayden 7-6 at halftime, but Thomas scored on a short touchdown run in the third quarter to put the Trojans up 14-7. After a Hayden touchdown pulled the Wildcats to within 14-13, Thomas answered right back with a 29-yard scoring run for a 21-13 lead after three quarters. Randall Zimmerman’s Junction City Blue Jays entered the season with high expectations. The Blue Jays returned 17 total starters from last season’s 10-1 campaign that ended with a 19-point loss to Derby in the state quarterfinals. Back for Junction City is senior quarterback Ryan Henington and four returning starters across the offensive line. All-State running back Raye Wilson has moved on to Missouri Western after an 1,800-yard, 29-touchdown season, but speedy Jovon Baldwin returns after rushing for more than 730 yards in 2015. In the Week 1 opener, Junction City shutout Emporia, 47-0, behind an opportunistic defense. The Blue Jays forced eight Spartan turnovers (5 fumbles, 3 interceptions) in shutting out the Spartans. Henington completed a solid 15 of 20 passes for 223 yards and four touchdowns, while Baldwin caught six balls for 80 yards and two scores. Tim Bell led the Bluejays with 76 yards on the ground. This will be the first meeting between the Trojans and Blue Jays since 2013 when Topeka won 21-14. The two have split the last six meetings with Topeka winning the last two in 2013 and 2012. The Piper Pirates continue their tour of the Frontier League on Friday night when they travel to Louisburg to take on the Wildcats. Piper entered the Class 4A-I rankings this week after a 23-13 win over another FHL opponent, Paola. The Pirates held Paola scoreless in the second half to secure the hard-fought 10-point win. The teams traded scores in the first half, but a pair of J.J. Letcher touchdown runs gave the Pirates a 16-13 halftime lead. Letcher added his third touchdown run in the third quarter after a 34-yard pass play from QB Jordan Goodpaster to Tyler Ash. Letcher carried the bulk of the load for the Pirate offense in Week 1. The 5-foot-8, 165-pould senior rushed 25 times for 209 yards and three scores. In fact, Letcher touched the ball on 27 of the Pirates 37 offensive plays, or 73 percent. Letcher was just as effective on defense where he recorded a team-high 13 tackles, intercepted a pass, and batted down another pass. Piper returns 15 total starters from a team that finished 4-6 last season with a playoff appearance. The Pirates have grown accustomed to the postseason under sixth-year coach Chris Brindle. Brindle is 39-20 since taking over the Piper program from current St. James Academy coach Tom Radke. The Pirates have reached the payoffs in each of Brindle’s six seasons. He also led Pleasanton to the 2-1A playoffs and an 8-3 mark back in 2008. Piper got some help on in the offseason with the addition of Brent Turner (6-1, 265), a transfer from North Carolina. Turner also serves as the kicker and punter for the Pirates. He converted 2 of 3 PATs and connected on a 31-yard field goal in the win over Paola. Louisburg faced a bit of uncertainty during fall camp when head coach Kyle Littrell resigned in the final week of August. Jeff Lohse and Gary Griffin were named as co-head coaches for the Wildcats for this season. Griffin led the Wildcats to the Class 4A state championship back in 2010. Louisburg had little trouble in recording a 48-0 opening-week shutout of KC Wyandotte. Korbin Hankinson rushed for a pair of touchdowns to give the Wildcats a 14-0 lead after one quarter. Hankinson was effective on the defensive side of the ball as well, intercepting three passes with two leading to Louisburg touchdowns in the second quarter. Thomas San Agustin broke off an 82-yard touchdown run, Grant Harding scored on a 29-yard keeper, and Jake Hill scored on a pair of 26-yard runs to give the Wildcats a 41-0 halftime lead. Like Piper, the Wildcats also bring back 15 starters in 2016. Harding (6-2, 200) takes over at quarterback this season after starting under center some as a sophomore in 2014. The backfield is loaded with San Agustin (5-10, 175, Sr) and four others with starting experience. Louisburg’s strength may be up front where the Wildcats return all Frontier League performers in Dustyn Rizzo (6-1, 220, Sr), T.J. Dover (6-4, 260, Sr), Mason Koechner (6-2, 260, Sr). Rizzo is also a standout on the defensive line where he registered 49 tackles, 8 tackles for loss, and five sacks in 2015. Holcomb delivered one of the more impressive Week 1 victories when the Longhorns rolled over Cimarron, 55-13, on the road. The Bluejays’ high-octane offense scored just 13 points, all in the fourth quarter. Holcomb blew the game open with 27 points in the second and 20 in the third. Holcomb, the defending 4A-II champions, open a challenging GWAC schedule against rival Scott City. The GWAC is one of the best conferences, top-to-bottom, in Kansas this season with all but one team (Goodland) reaching the playoffs in 2015. Holcomb has many key players returning, including running back/linebacker Dillon Williams and end Conner VanCleave. Cimarron finished with just three first downs versus Holcomb’s underrated defense. The Longhorns ranked first in the classification with just 10.1 points permitted in 2015. Junior Trey Gilbert enjoyed a standout debut with 11 of 17 passing for 279 yards and seven scores. A balanced rushing attack averaged 5.2 yards per carry for 191 yards, and five players caught at least one pass of 25 yards. Holcomb still turned the ball over five times but tallied 470 yards and 8.5 yards per play. Holcomb finished with eight sacks and three interceptions, including two sacks from junior Brayden Goddard. Scott City has solved Holcomb throughout the years with a 12-1 record in the last 13 meetings, including a 15-7 victory last year. The Beavers, though, opened with a rare regular season loss with a 31-21 home loss to Hays High in coach Jim Turner’s debut. Turner, the longtime defensive coordinator, took over for Glenn O’Neil, who went to Topeka Seaman. The loss to Hays marked Scott City’s first regular season defeat since a 25-6 road loss to Ulysses in Week 4 of 2013, and just the third loss in the last nine seasons. Hays High, 2-7 last season, trailed 21-10 midway through the third quarter before coming back for the win with three fourth-quarter scores. Hays quarterback Hunter Brown threw for 140 yards and three scores versus the Beavers’ traditionally stout defense. Scott City finished 9 of 22 for 128 yards and three interceptions, while Wyatt Hayes rushed for 19 carries for 99 yards and a score. For the first time in many years, Holcomb has a better defense than Scott City, which allowed just 8.8 points a game last season. These two teams could match up again in the 4A-II playoffs, but Holcomb gets the win Friday. One of the more anticipated regular season games features Wichita Collegiate traveling to Hoisington. The Spartans are the defending 3A runners-up, but made the move to Class 4A-II this year. Hoisington went 9-2 and 11-1 in its last two years and the Cardinals are ranked in the top-5 in 3A. Hoisington rolled over Kingman, 44-3, last Friday and rushed for 419 yards on 37 carries. Senior Hunter Hanzlick carried 12 times for 142 yards and four scores, while senior Cameron Davis had seven carries for 174 yards and two touchdowns. Entering the game, Davis had 10 carries for 115 yards in his career. Hoisington averaged 10.9 yards per play. Hanzlick has 3,544 career rushing yards with 55 rushing touchdowns and an average of 8.7 yards per carry. He has twelve, 100-yard rushing games in the last two seasons. The only time he fell short of the 100-yard rushing mark in the past two seasons came when he was held to 88 yards in a 44-6 playoff loss to Halstead last November. The Cardinal defense limited Kingman to 3.8 yards a carry and just 144 total yards. Hoisington has not lost a regular season contest since starting Week 1 of the ’14 season with a double overtime, one-point loss to Larned. Wichita Collegiate took heavy graduation losses, but the Spartans opened with a 41-6 victory against Rose Hill. Junior Cody McNerney completed 12 of 18 passes for 233 yards with four touchdowns against no interceptions. He also rushed 10 times for 77 yards as Collegiate averaged 4.1 yards per carry for 178 rushing yards. Overall, Collegiate averaged 6.7 yards per play. Senior Cooper Root tallied nine tackles, while senior Peter Larsen had an interception, forced fumble and recorded a sack. Last season, Collegiate had superb special teams with five non-offensive touchdowns. McNerney has done a solid job stepping in for Austin Waddell, while the Spartans also needed to replace Nathan Burgoyne (39 total scores), who replaced standout rusher Jacques Williams. It’s difficult to remain at a high level while replacing a standout quarterback and running back. Collegiate will be a playoff team, but will likely need at least one big non-offensive play to win Friday. 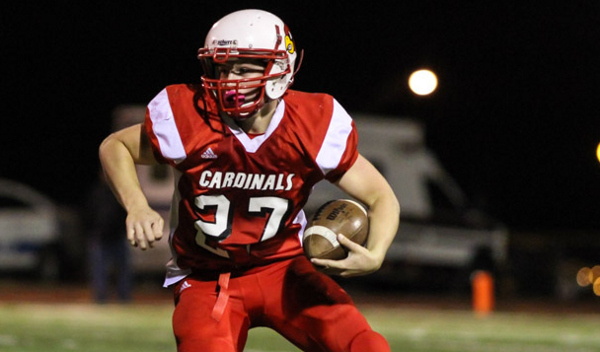 Hoisington has Hanzlick and the emergence of Davis gives the Cardinals plenty of weapons. Plus, the Spartans have a rare long road trip; in 2014, Collegiate travelled to Scott City for the playoffs and lost, 26-6. Matchups like these, featuring traditional playoff contenders from different part of the state, are great for Kansas high school football. Hoisington and Collegiate should be commended for getting this on the schedule. Overall, though, Hoisington has too much firepower and will be at home. Friday will mark the third time since Week 9 of last season that Smith Center and Phillipsburg will have met. Phillipsburg won both meetings in 2015. In Week 9, the Panthers won in the final minutes, 14-7. Three weeks later, Phillipsburg pulled away for a 40-6 sub-state championship game victory en route to the schools’ first Class 2-1A title. Phillipsburg moved back up to 3A this year. Smith Center, ranked second in Class 2-1A to begin the season, dropped three spots after a rare 20-16 loss to Plainville. The loss was the Redmen’s second defeat against the Cardinals since 1992 and first since 2011. Smith Center quarterback Thayne Benoit exited the contest with injury and Colton Hutchinson had to finish the game. Plainville knocked down Hutchinson’s pass on the game’s final play. Kaden Meitler paced the Redmen with 125 yards and a score. Hayden Friend, Plainville’s standout dual threat quarterback, had two passing scores on fourth down and finished with 217 total yards. Phillipsburg was in control throughout in a season-opening 36-6 win against Clay Center. The Panthers didn’t allow points until 74 seconds remaining in the contest. Phillipsburg was up 8-0 at halftime and 15-0 late in the third quarter. The Panthers, which have three home games to start the season, have actually been a much stronger road/neutral team than at home the last two years. Last season, the Panthers’ two losses came at home by a combined three points, including a 7-6 Week 2 loss to Norton. Phillipsburg hasn’t lost away from home since Week 2 of the 2014 season. However, the Panthers, with 11 more players than Smith Center, have more depth in the backfield with Mark and Kirk Coomes and quarterback Trey Sides. They also have defensive stalwarts such as junior linebacker John Gower. Phillipsburg has won five straight in this series and six of seven overall. In those last five contests, the Panthers have limited Smith Center to six, 18, seven, seven and six points. Phillipsburg has rarely needed to pass against Smith Center, averaging 8.4, 7.7 and 10.4 yards per carry in the victories from ‘12-14 and 5.6 in the sub-state title game. The Panthers’ depth, defense and multiple running options yield a win. Two familiar Lyon County League teams that enjoyed break-out success last season match up in a back-and-forth series. Since 2004, Hartford holds a 7-5 edge, though Burlingame won the last two contests, 26-0 and 54-6. Burlingame finished 11-1 last season, the first team’s first playoff berth and Lyon County League title since 2004. It marked the school’s first sub-state berth in 43 years. Hartford finished 7-3 for its first playoff berth since ’02, and then was the Class 1A, Division II boys’ basketball state runner-up, its best finish on the hardwood. Hartford opened with a 60-14 victory at Waverly behind standout performances from quarterback Danen Kistner and running back Clayton Fowler, who scored in three ways. Fowler returned a kickoff 55 yards for a touchdown, rushed for an 18-yard score, and caught 65-yard touchdown pass. Kistner accounted for six scores, five through the air. Burlingame started with a 58-8 victory against Southern Coffey County behind a great game from quarterback Dalton Sporing. Sporing had five touchdown passes and two scoring runs of 30 and 27 yards. Junior Tristan Lee (12 tackles) led the defense. The Bearcats suffered two major graduation losses with running back Robert Hutchins and defensive end Paul Holt, but opened with 161 passing yards and 236 rushing on just 36 snaps. Junior Colton Noonan averaged 19 yards on three punt returns last fall, and had four non-offensive scores, including a pair of punt and kick return touchdowns. Last year’s game was tied at six before Burlingame scored 28 points in the second quarter and 20 in the third. Both teams have excellent special teams and the third phase is going to be critical, especially with Noonan and Fowler. However, Kistner and Fowler do enough to win in what should be a high-scoring contest.